In the old days, posted letters and cards were the most common means of communication of people over a distance. A handwritten letter leaves a personal, tactile record of interpersonal communication, creating an engaging experience and enticing us to read it again and again. Today, with ubiquitous mobile devices and social networks, we are more connected than ever, regardless the distance. Yet, the contents of interpersonal interactions are blended with the everyday recording of everything on our forever online devices that makes for social streaming. The importance of those memories gets lost in the steady stream of more ordinary events. Moreover, these digital memories are never stored in an organized way for preservation. They are transient and easily forgotten in our busy everyday life. How do we materialize and preserve digital memories so that we can be engaged and reminisce in a way that is similar to how we flipped through a photo album or touched a letter in a souvenir collection box in the old days? MemoryReel is our attempt to engage people with their important digital memories, by bringing back those moments with their partners or friends to their physical world. With our design, one can collect text or audio messages from instant messaging applications, as well as capture special moments of a video call and save the motions from both parties as animated GIFs. 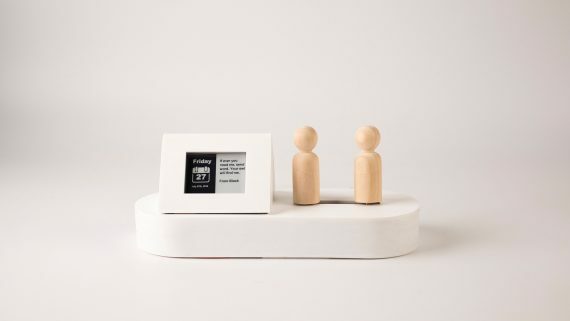 These digital memories will be saved onto the MemoryReel desktop device and then displayed either automatically or through tangible interactions, engaging people in an offline reminiscence experience. The philosophy behind MemoryReel is to regard memory as a core means of promoting positive experiences and psychological well being. Through making important memories sustainable, we create opportunities for people to reminisce and reflect. Our participants uniformly welcomed the design concept of collecting and playing back digital memory content to remind people of their closed others. The most favourable design feature is the use of anthropomorphic avatars to both represent oneself and a partner/friend, and as the device control to enable the interaction with memory contents. The gestural interactions include turning the avatar, which will play the next content, and moving the avatar along the track to three positions to activate three modes of playback: text, audio and video. Our project started with building an understanding of people’s experience of relationships and attitudes towards memory, through a two-act user inquiry that consists of a diary study and an interview with a diverse sample of participants. We then created an interactive proof-of-concept prototype that include a physical computing core unit enabled with tangible gestural control, a screen display for texts, a mini projector for animation GIFs, and an application interface. A group of people with diverse cultural backgrounds and ages (ranging from 20 to 43) experienced the prototype, with the AB test of displaying the video content via a mini projector or on a phone screen. They reported feelings of fun, connectedness and self reflection as expressed in varied emotions.